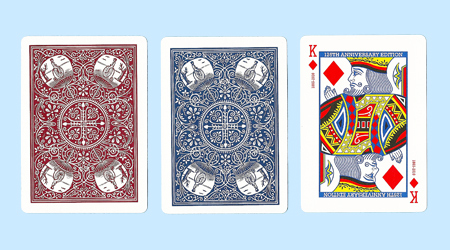 These 125th Anniversary Bicycle Playing Cards commemorate Bicycle Cards' 125 year existence. The cards feature original Bicycle artwork that dates back to 1885. Each deck is packaged in a unique and stylish foil tuck box that draws attention to the cards. For additional information or wholesale pricing on Bicycle 125th Anniversary Playing Cards, please contact us at 1-800-233-0828.